I’d never seen a later model Montesa Enduro bike, but I was immediately interested when I saw this in Mike Gallagher’s collection. 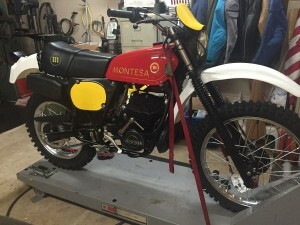 I was there to pick up an OSSA “Black Six-Days” that we’d been talking about for five years! A week later, the H-6 was mine also. Joe Bilazzo owned it for a while also. The red frame that attracted me turned out to be incorrect – these were black from the factory! I’m slowly getting it back to showroom condition – correct shocks and speedo are next. Good looking Enduro mount!